The larger the circle, the bigger the plant’s production capacity, while the color of the circle represents the fuel source. Nearly all of these retiring plants are fossil-fuel plants, with the overwhelming majority being coal-fired plants (the appropriately gray-colored dots). Many of those plants are centered around the Appalachian coal fields of West Virginia and Kentucky, with another cluster in Georgia. This map shows a very different picture - lots of solar (sunny yellow dots) coming online in California (and qute a bit in North Carolina!) with lots of wind (green dots) in the center of the country. Keep in mind that this is only showing utility-scale facilities, so all of that rooftop solar that folks like us are installing on homes and businesses doesn’t factor into this figure. Those installations are helping to keep the demand for power down, meaning that you can eliminate more sources of power than you are adding and still meet the need. This is the trend that we need to see - more and more dirty energy sources being retired, replaced by fewer, cleaner power plants. Since cost-benefit analyses appear to be the rage in the New Year, particularly regarding solar, we were struck by a piece over at Greener Ideal documenting three key ways in which the solar industry boosts the overall economy - here’s hoping these are being factored into those analyses! 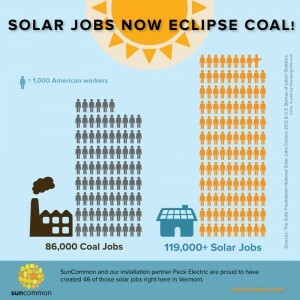 The most significant way is that solar power means jobs - actually more jobs in the U.S. than does the coal industry! Indeed, the U.S. solar industry employs 119,000 people compared to just 86,000 working for coal companies. Moreover, job growth in the solar industry far outpaces that in the coal industry. In 2012, solar jobs increased by 13% while the overall U.S. economy was growing by just 2.3% and the fossil fuel industry lost jobs overall. Of course, most coal-related jobs are with large corporations whereas many solar jobs are found in small businesses, like Run on Sun, which might explain the disproportionate impact that the coal lobby has over the solar industry trade groups like SEIA. But seriously, if you were advising your child about where to look for work in the 21st Century, would you want to send them toward a coal mine or a solar farm? While the solar industry is not without its risks, cave-ins and Black Lung are not among them. All fossil fuel is finite; we aren’t making anymore during our lifetimes or those of our offspring. By contrast, energy from the sun will be around as long as humans inhabit this Earth - it is clean, abundant, and free. Every solar-powered kilowatt-hour that we generate means that much less coal to be mined, natural gas to be “fracked” or barrel of oil to be imported from unfriendly regions of the world. A stable supply of renewable energy frees our country from a host of problems both natural and man-made. Last, but by no means least, solar saves people money. Serious money, in fact. For commercial building owners, that savings can translate into the ability to hire more workers. For residential clients, the savings are more money to spend in the local economy, boosting employment in your home town. 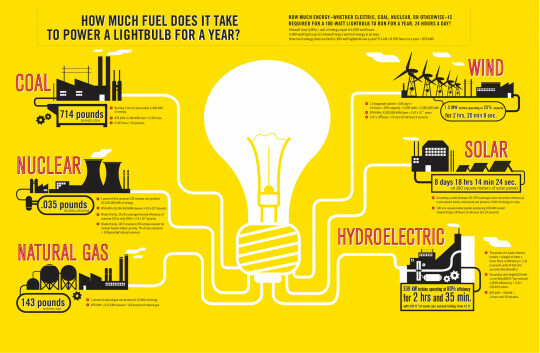 Just three reasons why 2013 is the Year to Go Solar!